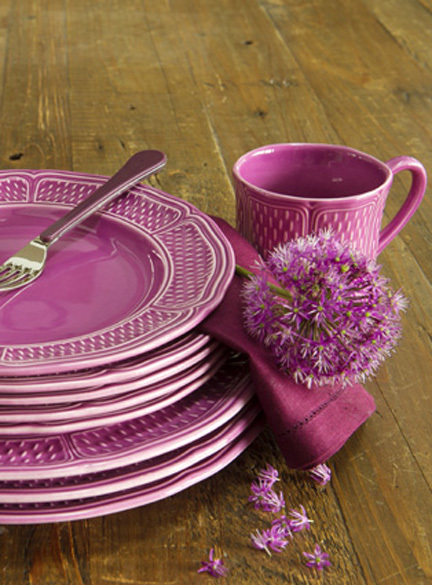 Selecting a dinnerware collection is an exciting task! With a myriad of options to choose, we at Gracious Style are here to help narrow your search, and find the style that is perfect for you. 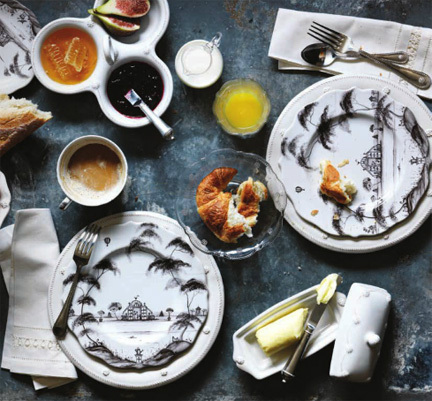 Whether you are looking for formal china, or fun, everyday essentials, we break down the basics and answer any questions that may arise. 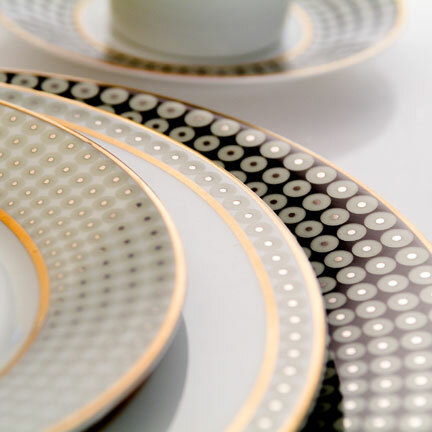 What are the different types of materials used to make dinnerware? 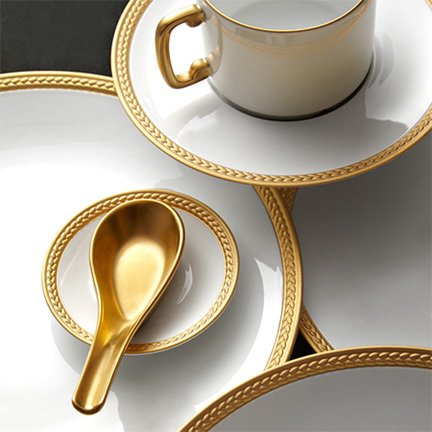 Luxury dinnerware is usually made of either porcelain or bone china. Casual dinnerware is made from earthenware or stoneware because these are usually more durable, easier to care for, and lower in price. 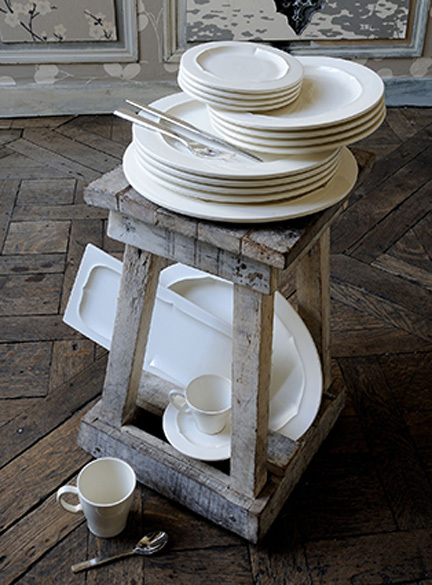 – Porcelain: The key ingredient, kaolin, is what makes porcelain so extraordinary. Fired at a the highest temperatures, porcelain combines a stark white appearance with incredible durability to make timeless pieces that will last in beauty and reliability for years to come. Well-known names to consider include Raynaud, Haviland, and Philippe Deshoulieres. And if you appreciate hand-painted porcelain, Herend and Anna Weatherley make beautiful pieces. Care: Most porcelain items are dishwasher and microwave safe. We recommend hand washing for larger pieces, handpainted collections, or items with gold or platinum decoration. Items with metallic decoration should not be microwaved. – Bone China: This is a very fine, soft-paste clay that is made from several key ingredients, including bone ash. The result is a beautiful, high translucency white with warm, ivory tones. Considered by many to be the finest quality of china, it has great strength and very high chip-resistance. 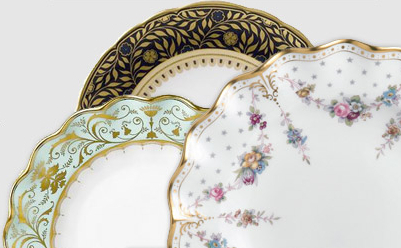 Brands we suggest: Pickard, Royal Crown Derby. Care: Most bone china items are dishwasher and microwave safe. We recommend hand washing for larger pieces or items with gold or platinum decoration. Items with metallic decoration should not be microwaved. – Stoneware: Ideal for casual dining, stoneware is fired at very high temperatures to produce pieces which are durable and quite chip-resistant. Available in a numerous range of colors, some pieces also have beautiful crackled surfaces. Brands we suggest: Gien, Jars, Juliska, Vietri. – Earthenware: as it is fired at relatively low temperatures, this type of pottery is more porous and less translucent than either porcelain or bone china. These pieces are relatively thick and heavy, and their natural colors range from from buff to red, depending on the clay used. A much-beloved characteristic of earthenware is that it is likely to crackle as the clay expands and contracts, but this does not affect the use of the piece. Brands we suggest: Vietri. Care: Dishwasher safe; most are microwave safe on low to medium settings. We recommend avoiding sudden temperature changes. Limoges refers to a region in France where some of the earliest porcelain pieces were produced as far back as 1765. 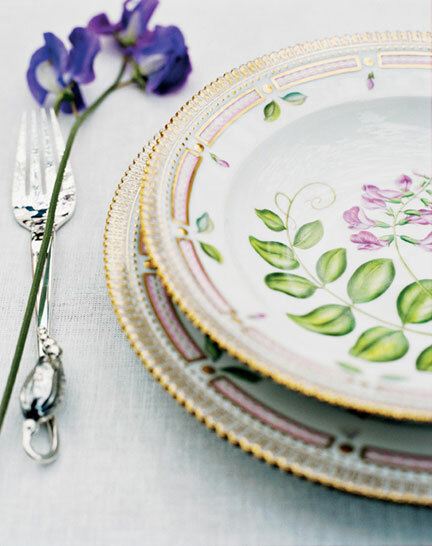 For centuries, the name Limoges has represented the finest quality and craftsmanship in porcelain throughout the world. 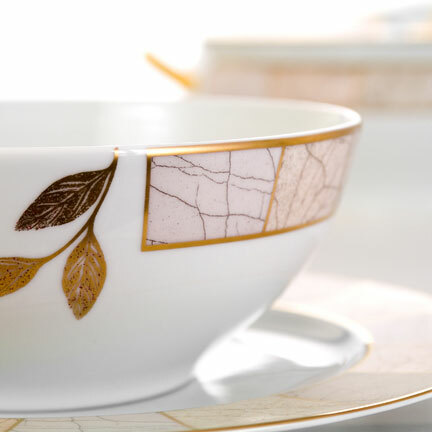 Limoges porcelain is very white; most of the best-known producers of French porcelain are based in Limoges. 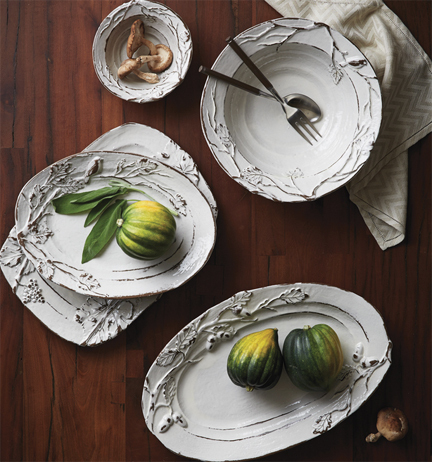 What are some simple ways to determine quality in dinnerware? – Hold the piece up to the light and you should be able to see the shadow of your hand behind the porcelain. – Flick the plate with your fingers and listen for a resonant ring. – Examine the color and make sure the glaze is even; the finish should be smooth and lustrous. What dinnerware styles are available? 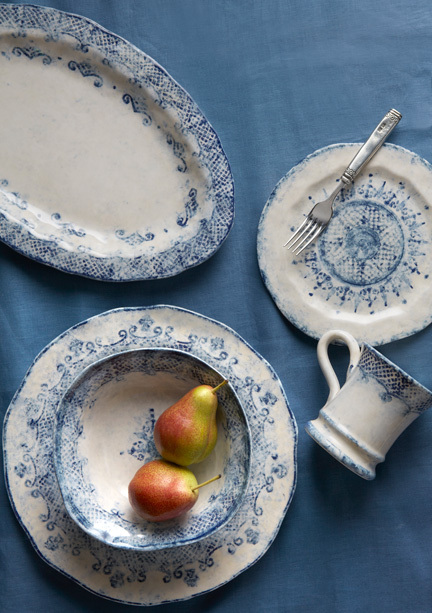 Generally, dinnerware is broken down into casual and formal collections. From there, you can choose between four major styles: solid (meaning one color throughout, with no pattern), banded, patterned, and handpainted. If you’re looking for something with a monogram or in a specific color, take a look at our custom dinnerware collections. 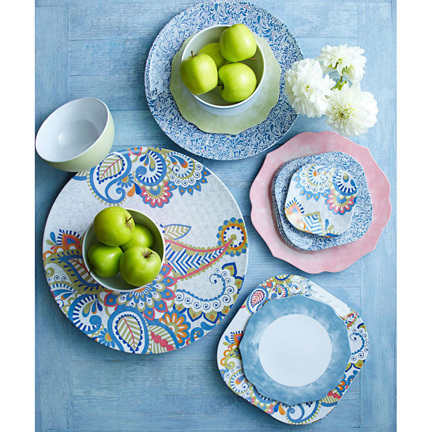 And for outdoor entertaining, there are also outdoor dinnerware collections available. How many dinnerware collections do I need? In making this decision, we suggest considering the size of your family, the type of entertaining you are most likely to do (formal seated dinners or buffet brunches), and the complexity of your menus. 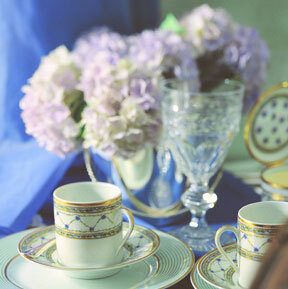 Many people choose to have at least one casual collection for everyday use and one formal collection for selected occasions (usually porcelain). How many settings do I need? We recommend registering for twelve five-piece place settings, as these will see you through most dinner parties. 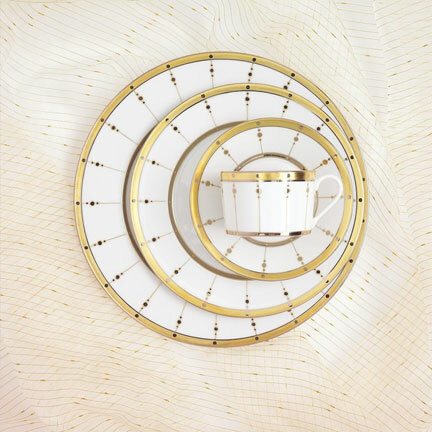 These five-piece settings typically include a dinner plate, salad or dessert plate, bread and butter plate, tea cup, and tea saucer. 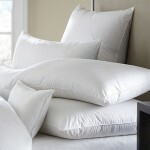 On more casual collections, you will sometimes see four-piece settings available. These normally include a dinner plate, salad plate, bowl, and mug. While you may not always be entertaining for twelve, having additional pieces will guarantee that you have spares when items break or unexpected guests show up. From time to time, collections or specific pieces do get discontinued, so if you love a piece, buy it while you can. What is included in a five-piece place setting? 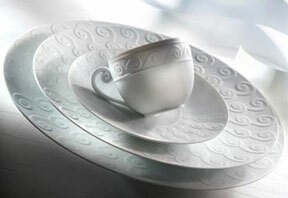 A five-piece formal setting consists of a dinner plate, salad plate, bread/butter plate, teacup, and saucer. 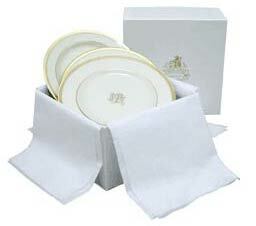 What is included in a four-piece place setting? On more casual collections, you will sometimes see four-piece settings available. These normally include a dinner plate, salad plate, bowl, and mug. 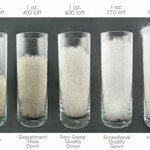 What are standard dinnerware sizes? What is a presentation plate? Also known as chargers or buffet plates, presentation plates are oversized plates (12″ diameter) designed to add color and style to your table setting. These are usually removed before the main course is served, although they are also frequently used as buffet dinner plates since they can hold larger quantities of food. What kinds of serving pieces do I need? How do I care for my dinnerware? 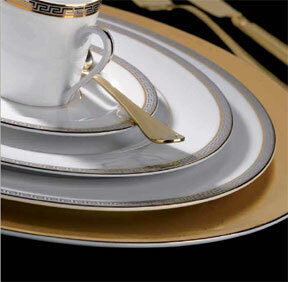 Most dinnerware items are microwave and dishwasher safe, unless they are decorated with gold or silver. 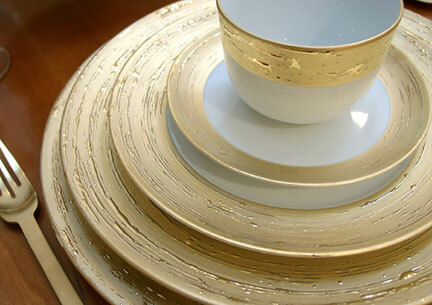 We recommend hand washing for larger pieces, handpainted collections, or items with gold or platinum decoration. Items with metallic decoration should not be microwaved. 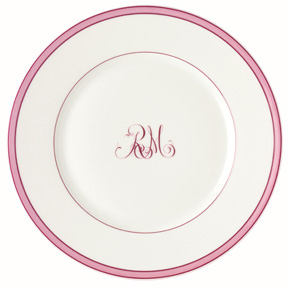 How should I monogram my dinnerware? 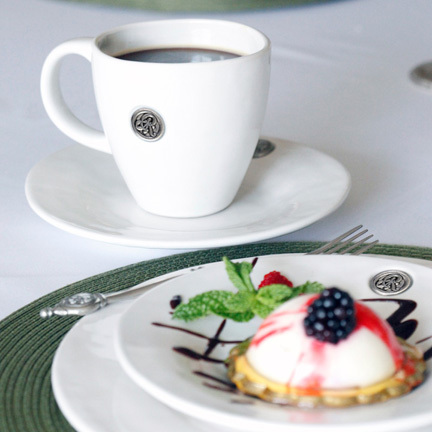 If you choose to have your dinnerware monogrammed, consider several different options. Single-letter monograms usually feature the first initial of the last name. On three-letter monograms, most individuals choose to have their first, middle, and last or first, last, and middle initials embroidered. For married couples, a popular choice is the initials of the couple’s first names on either side of their married last name. Would you like to see more styles? 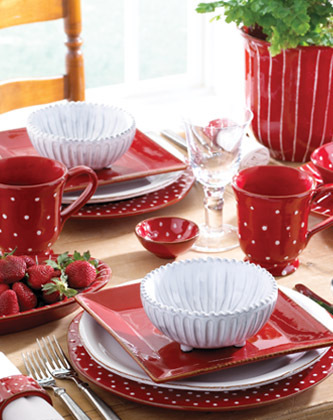 Click here to view all our dinnerware collections. $50 for a cereal bowl, $185 for ice tongs? I am wealthy, but you people are crazy. These are plates to eat food. I could use a paper plate or paper towel for the same purpose and send the money to poor people who do not have enough food to eat. If that is how you choose to live your life, you have our respect. But please also respect other people who may want something better made, more stylish, or simply more beautiful for their lives, not to mention the artisans who create those products. I have 4 very sm cups & saucers. Plates are 4″ brown & white same as 4 sm 2″ cups. Royal Crown on bottom over a crown. I have no idea on value or where to purchase more ? Please help if you can.Maybe childs set. Same size pink white/gold #2822 different pic on bottom. Please check with replacements.com or another site that specializes in vintage dinnerware. 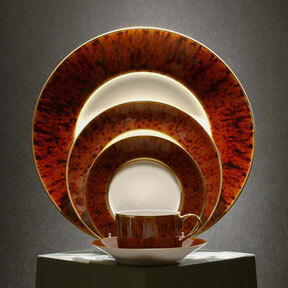 Please see http://www.graciousstyle.com/shop/richard-ginori We should have all the Richard Ginori dinnerware there.